Huge Savings Item! Save 17% on the Neutral White Glow In The Dark Pigment Powder - 60g (2 Ounces) - 10+ Colors Available by Art 'N Glow at Designers Artists. MPN: ANG-60G-GP. Hurry! Limited time offer. Offer valid only while supplies last. Glow In The Dark Pigment Powder by Art 'N Glow Artists and creators from all over the world use our glow paints and powders for their projects. Artists and creators from all over the world use our glow paints and powders for their projects. Usable in any transparent medium, our customers have created resin castings, glow in the dark canvas paintings, star murals, glowing glass figurines, glow in the dark clothing, and more! What will you create? Click "ADD TO CART" today and be sure to share your creation with us. Our 30 DAY MONEY BACK GUARANTEE means you can buy with confidence. • Uses: Resin/rubber/plastic casting, glow paint pigment, molten glass, fishing lures, glow furniture, luminescent clothing, costumes and props, murals, star ceilings, emergency and industrial applications, nail polish, wax, glue, glaze, etc. • Safety: Non-toxic and non-radioactive. Made from naturally occurring rare earth aluminates. Do not ingest or inhale. • Best charged in the sun or with an ultraviolet/black light. A FREE ultraviolet keychain light is included with each bag of powder. i.e. one light per 2 ounces. 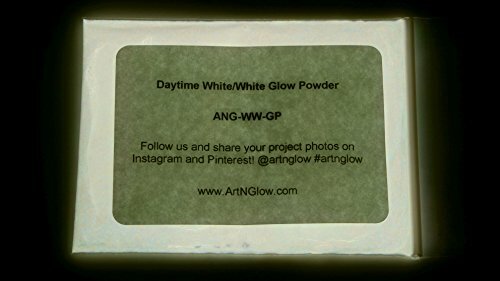 White glow powder pigment from Art 'N Glow, the premier glow in the dark supplier for fine arts, crafts, and DIY projects. Each order includes 2 ounces (60 grams) of coated strontium aluminate glow powder which is the brightest, longest lasting glow in the dark technology available anywhere. Our glow pigment is packaged in a re closeable zip lock bag for your convenience and EACH 2 oz bag includes a FREE UV LED keychain charging light that will have you glowing in seconds. The maximum particle size of our phosphorescent crystals is between 30 and 50 microns depending on the color. This is the ideal size for general craft projects including resin/epoxy, paintings, murals, glass blowing, wax, jewelry making, etc. Since all of our powders are waterproof, they can be used in water based mediums like acrylic paints without any issues. We are proud to offer a large selection of the highest quality glow materials available and each one is packaged by hand in the USA. As a locally owned small business, we stand by our products and are happy to answer any application questions you may have. Additionally, our products are made from naturally occurring elements and are non-toxic and non-radioactive. Safe for the environment and you! ORDER TODAY to start experiencing the magic of glow! Shop with confidence knowing that our 30 day, 100% money back guarantee is there for you if our product does not meet your needs. View More In Paint Making Materials. If you have any questions about this product by Art 'N Glow, contact us by completing and submitting the form below. If you are looking for a specif part number, please include it with your message.